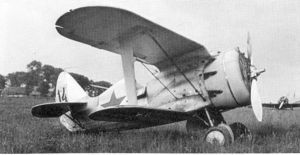 The Russian Polikarpov I-153 Chaika (Russian Чайка, "Seagull") was a late 1930s Soviet biplane fighter. Developed as an advanced version of the I-15, the I-153 saw limited service, but fought in the Soviet-Japanese combats in Mongolia. The Polikarpov I-15 was an unpopular design with VVS. The distinctive "gullwing" top wing offered poor longitudinal stability and visibility, the aircraft suffered from poor build quality, and top speed was considerably worse than that of the I-16 monoplane. As the result, the I-15 was withdrawn from production in 1935. In 1936, a batch of I-15s was sent to aid the Republicans in the Spanish Civil War. The aircraft performed well enough to make VVS reconsider their view of biplane fighters and Polikarpov was ordered to create an improved version based on combat experience. While the wholly unremarkable I-15bis was entering production, the OKB was already working on a more advanced version with the new ShKAS machine guns, Shvetsov M-62 engine, and retractable landing gear; this was one of the first projects that Artem Mikoyan of future MiG fame actively took part in. The proposal for the new fighter called I-153 (literally, I-15, 3rd version) was submitted in 1937. The first prototype powered by the Shvetsov M-25 engine was completed in August 1938. It failed factory testing due to numerous defects which were largely corrected in the second prototype and the aircraft entered production concurrently with ongoing testing and development. In test flights, the I-153 (M-25) achieved the top speed of 424 km/h (263 mph), service ceiling of 8,700 m (28,543 ft), and required 6 minutes 24 seconds to reach 5,000 m (16,404 ft). This was disappointing performance but Polikarpov had high hopes for the new Shvetsov M-62 engine. The first I-153 (M-62) was delivered on 16 June 1939. Top speed improved to 442 km/h (275 mph) with service ceiling of 9,800 m (32,152 ft). This was still short of the projected top speed of 462 km/h (287 mph). In addition, one of the production aircraft disintegrated in a 500 km/h (311 mph) dive revealing a significant structural weakness. Combined with other defects revealed in testing and persistent poor visibility caused by the top gullwing, the aircraft failed the government acceptance trials. While numerous improvements were proposed, many were too radical to be implemented since the aircraft was already in production. Desperate to improve performance, Polikarpov tested two I-153 with the Shvetsov M-63 engine with 820 kW (1,100 hp). However, the results were disappointing and it was becoming painfully obvious that the biplane airframe was incapable of higher speeds. One of the rarely mentioned characteristics of the I-153 was its poor performance in a spin. While the Polikarpov I-16 had gained notoriety for entering spins, it was an easy aircraft to recover. In contrast, while the I-153 was difficult to spin, once it lost control, recovery was difficult to the point where intentional spinning was forbidden for some time. A spin recovery procedure was eventually developed but, while effective, it required flawless timing and execution. By the end of production in 1941, a total of 3,437 I-153s were built. The I-153 first saw combat in 1939 during the Soviet-Japanese Battle of Khalkin Gol in Mongolia. The Japanese Army Air Forces' Type 97 Fighter (Nakajima Ki-27) Nate proved a formidable opponent for the I-15bis and I-16, but was more evenly matched with the I-153, which retained agility inherent to biplanes while featuring improved performance. While the overall I-153 performance was satisfactory, some significant problems were revealed. Most troublesome was the absence of a firewall between the fuel tank mounted in front of the cockpit and the pilot. Combined with strong draft coming in through the wheel wells, fuel tank fires invariably resulted in rapid engulfment of the cockpit and severe burns to the pilot. In addition, the M-62 engine suffered from a service life of only 60-80 hours due to failures of the two-speed supercharger. Stalin's purges in the 1930s resulted in a tremendous lag in Soviet aircraft at the beginning of World War II. Although the new Yak-1 and LaGG-3 fighters were entering production, on 22 June 1941, the bulk of VVS was equipped with the obsolete 1930s designs including a large number of I-153. Even as late as 1942, there were attempts to reinstate production of I-153 and I-16 to fill the shortage of fighter aircraft. The Polikarpov I-153 never flew with any Spanish Air Force units during or after the Spanish Civil War. Two earlier variants of this aircraft, the I-15 and the I-15bis, did fly with the Republican Air Force during the conflict and, later, captured examples of both types were used by the Fuerzas A�reas till the early 1950s. I-153BS - This version was fitted with four 12.7 mm (0.5 in) Berezin BS machine guns, instead of ShKAS machine guns. I-153DM (Dopolnityelnyi Motor - supplementary engine) - On an experimental basis, the I-153DM was flown with gasoline-burning ramjet engines under the wings. DM-2 engines increased the top speed by 30 km/h (19 mph) while more powerful DM-4 engines added as much as 50 km/h (31 mph). A total of 74 flights were performed. I-153V (Vysotnoi - height) - A single aircraft fitted with the definitive Schyerbakov 'minimum leak' pressure cabin. 50 I-153 were equipped with larger oil tanks and plumbed to accept external fuel tanks under the wings which doubled the combat range. These were largely used by the Soviet Navy. I-190 - experimental version powered by a 820 kW (1,100 hp) M-88V radial piston engine with two ShVAK cannon and four ShKAS machine guns. First flight 30 December 1939 but crashed 13 February 1941 and variant discontinued. I-190GK (Germetichyeskoi Kabine - hermetic (pressure) cabin)- The second I-190 prototype completed with a pressure cabin and turbo-charged M-90 engine fitted with a ducted spinner. I-195 - Strengthened I-190 with enclosed unpressurised cockpit, powered by an M-90 with ducted spinner and identical armament to the I-190. The prototype was not completed. In the early 1990s, New Zealand pilot and entrepreneur Tim (later Sir Tim) Wallis' Alpine Fighter Collection organised the restoration of three I-153s and six I-16s to an airworthy condition, this project being completed in 1999 as the third and final I-153 arrived in New Zealand. These aircrafts are equipped with AZsh-62IR geared radials instead of M-62, which were non-geared. The reason is that AZsh-62IR is just a version of M-62, with absolute equality in all instead of a frontal gearbox and weapon synchronizer absence. Also, none of original engines from recovered wrecks could have been brought to life. After a spectacular international debut at Warbirds over Wanaka 1998 (for the I-16s) and 2000 (for the I-153s), some of the aircraft were sold off around the world, to the Commemorative Air Force in the U.S., to Jerry Yagen of Virginia, and an I-16 to Spain. All of the I-16s have been sold to overseas owners, and although some I-153s remain at Wanaka, it is believed all will eventually depart for elsewhere. Finnish Air Force operated 21 captured aircraft, 11 of which were bought from Germany, of which 10 were actually delivered. They flew with the serial numbers IT-11 to IT-31. Abanshin, Michael E. and Nina Gut. Fighting Polikarpov, Eagles of the East No. 2. Lynnwood, WA: Aviation International, 1994. ISBN 1-884909-01-9. Gordon, Yefim and Keith Dexter. Polikarpov's Biplane Fighters (Red Star, vol.6). Earl Shilton, Leicester, UK: Midland Publishing, 2002. ISBN 1-85780-141-5. Green, William. "End of an Era... Polikarpov's Chaika." Air Enthusiast, Volume 1, Number 1, June 1971. Bromley, Kent, UK: Pilot Press Ltd., 1971. Green, William and Swanborough, Gordon. WW2 Aircraft Fact Files: Soviet Air Force Fighters, Part 2. London: Macdonald and Jane's Publishers Ltd., 1978. ISBN 0-354-01088-3. Keskinen, Kalevi, Kari Stenman and Klaus Niska. Venx�lx�iset Hx�vittx�jx�t (Suomen Ilmavoimien Historia 7) (in Finnish). Espoo, Finland: Tietoteos, 1977. ISBN 951-9035-25-7. L�onard, Herbert. Les avions de chasse Polikarpov (in French). Rennes, France: Editions Ouest-France, 1981. ISBN 2-85882-322-7. L�onard, Herbert. Les chasseurs Polikarpov (in French). Clichy, France: x�ditions Larivix�re, 2004. ISBN 2-914205-07-4. Maslov, Mikhail A. Polikarpov I-153 (Wydawnictwo Militaria 222) (in Polish). Warsawa, Poland: Wydawnictwo Militaria, 2005. ISBN 83-7219-222-7. Stapfer, Hans-Heiri. Polikarpov Fighters in Action, Part 1 (Aircraft in Action number 157). Carrollton, TX: Squadron/Signal Publications, Inc., 1995. ISBN 0-89747-343-4.